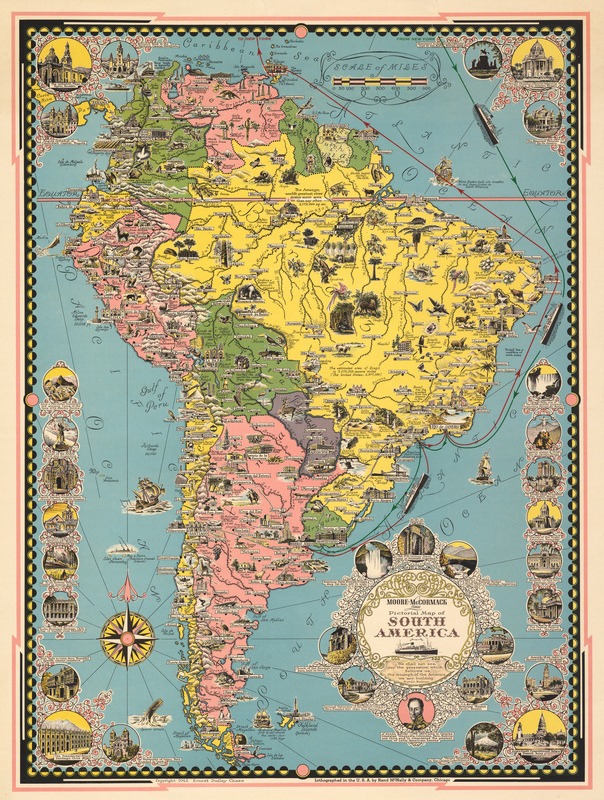 WWII Era Pictorial Map of South America - theVintageMapShop.com - the Vintage Map Shop, Inc. This is a fine print reproduction of a lovely pictorial map, ordered by Moore-McCormack Lines of New York, which symbolized the solidarity between the USA and South America during WWII. The title cartouche features intricately drawn vignette images of important architectural edifices and historical places on the continent, along with sites of natural beauty. Simon Bolivar is featured in the center bottom of the cartouche, along with a brief description of him and his importance. Similar vignettes line much of the border of the map, featuring important places and attractions of the countries in South America. Industrial and agricultural enterprises are featured in many places on the map. Much of the geography of the continent is rendered, along with myriad representations of its abundant forms of wildlife. A wide variety of seagoing vessels of different eras ply the waters, and a number of routes for sailing around the eastern edge of the continent are shown in detail. A compass rose designed according to traditional cartographic tradition embellishes the lower left quadrant. The entire fleet of Moore-McCormack was placed at the disposal of the nation‘s defense establishment immediately after Pearl Harbor. During the war, the Company was assigned responsibility for the operation of 707 different vessels, 2,199 different voyages and the movement of over 20,400,000 tons of vital war cargo to every theatre of the war. Ships in the Company‘s pre-war fleet became baby flat-tops, destroyer and submarine tenders, cargo attack ships, troop transports and performed many other war services. The company lost a total of seven vessels during that time.